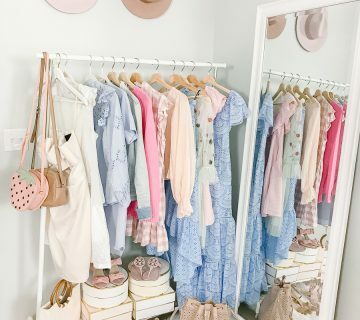 My wardrobe is getting ready for Spring, I just need the weather to catch up! 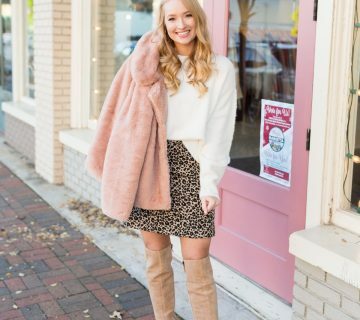 Yesterday on my Youtube channel I shared a try on haul of recent purchases so I wanted to round them up here for you along with some latest Instagram outfits. 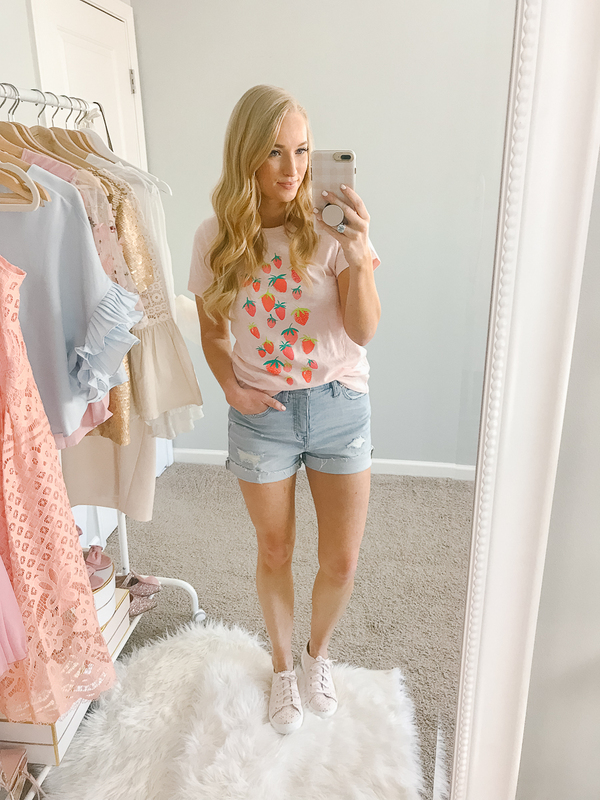 I had to have this pink strawberry basic tee! I’m wearing a small here tucked into Madewell shorts from last year. 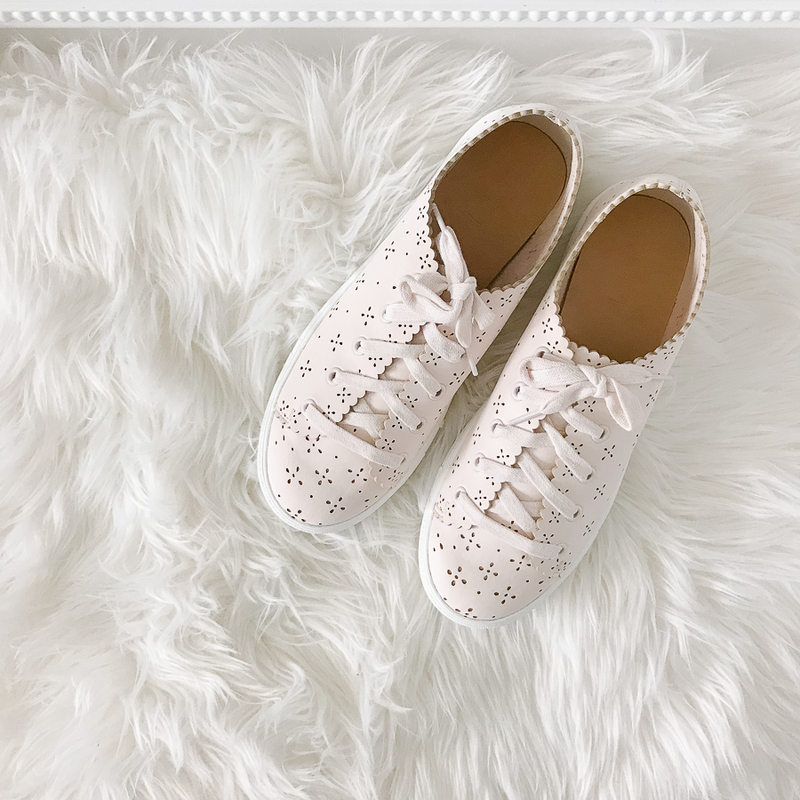 And let’s take a moment to talk about these eyelet sneakers (see below). They are TOO CUTE and make are the perfect solution for the girlie girl who still wants to wear platform sneakers. They run TTS with maybe a tiny bit of extra room and come in 4 colors. I have the blush color, of course. 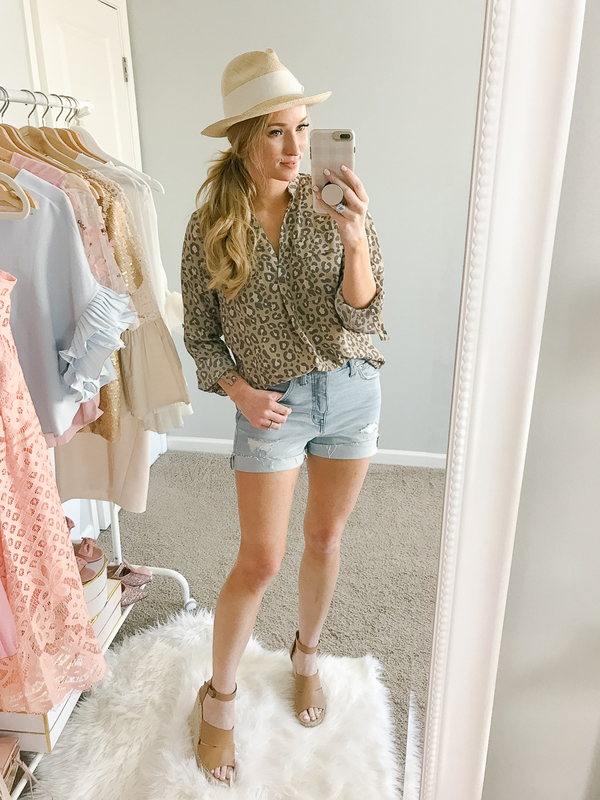 I wasn’t sure about this leopard blouse because I typically don’t care for tops that don’t have the same material on the back. This one has a beige-tan cotton blend back, but I love how it looks so I’m going to let it slide. I also love the white and blue version, I may have to go back for it. I love the color of this top. These are typically my go-to for work when it’s warm out, although I usually get cold and have a cardigan over it! The sleeves on this are slightly long but it would look good with a tuck on the end. I’m wearing the Walmart jeans and you can read a detailed review of them here. This top runs big, I’m wearing a small here. It’s great to wear with leggings if you can get away with those at work, it has extra length than the typical blouse. I wore this traveling to Florida a few weekends ago for my friend’s wedding. Leggings are always my go-to choice for travel, and although it was warm in Florida it was definitely still chilly at home! 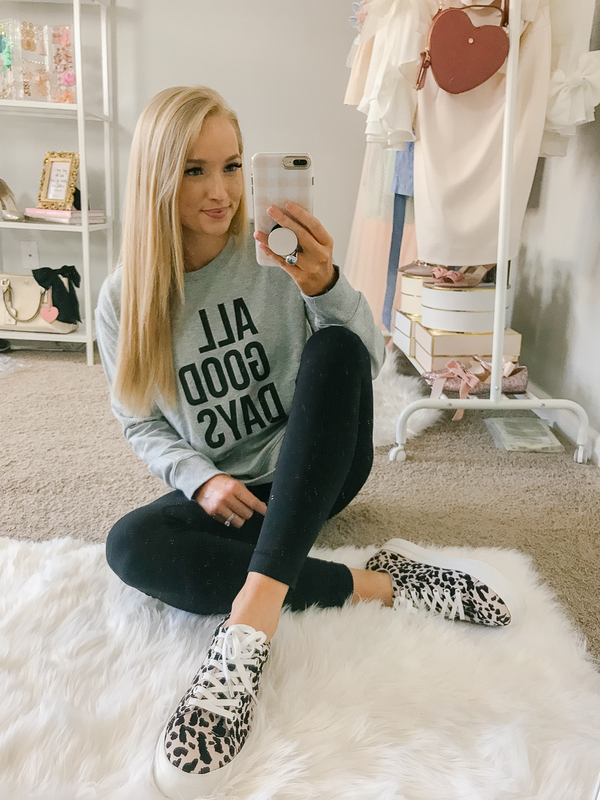 This All Good Days sweatshirt is an affordable buy and was just enough warmth to work in both locations. I sized up to a medium to have a cozy fit. As for the leopard sneakers, they run really small so definitely size up. This was my OOTD while exploring Siesta Key. Tim and I ate breakfast at the Sun Garden Cafe which had a great patio atmosphere. This was my first time wearing these wedges and I was so impressed by how comfortable they were walking around most of the day. 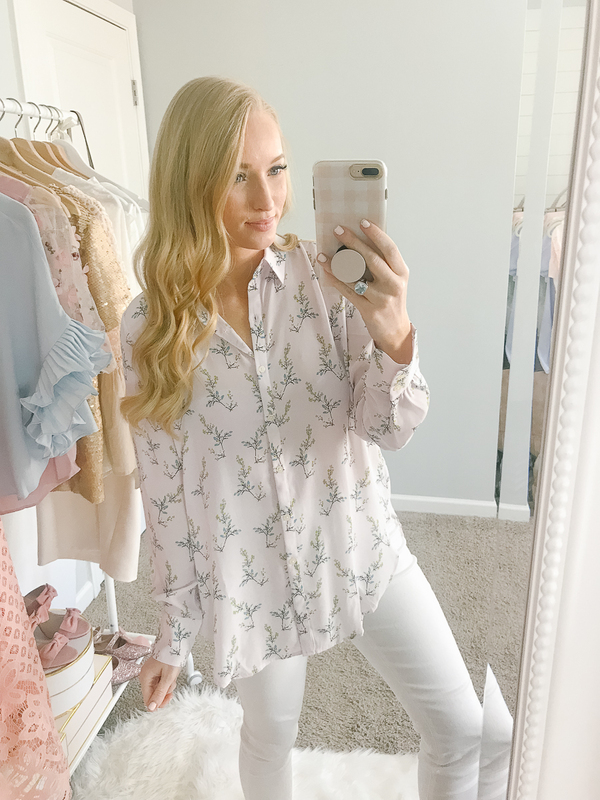 My tee is a favorite under $35, so much so I think I want to pick up another color. It’s really soft and comfortable but more dressed up than a basic tee. I’m wearing a small. Read more about my white jeans from Walmart here. 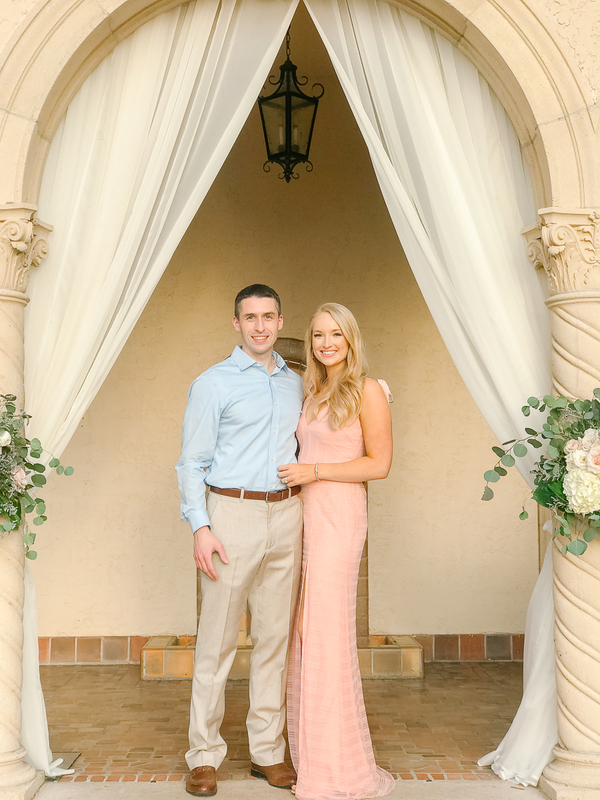 I wore this dress for my friends wedding and I absolutely loved wearing it! It has bow tied sleeves and a fun slit. I purchased it on sale and it’s now sold out. I’m wearing a medium. 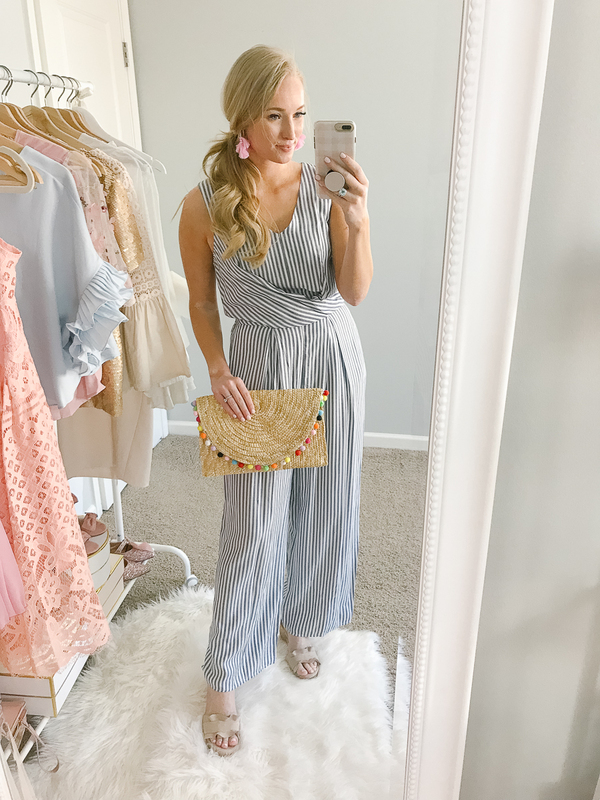 One of my most popular Instagram outfits from the month so far, y’all love this dress as much as I do! I think I want to get a second color, but the blue is definitely my favorite. I sized down to a XS here and the fit is perfect. Wearing it with this neutral bag (you can see it in my Target try on haul) and the same tan wedges (run TTS). This dress isn’t the most flattering but I love the print. I ordered the pants that I’m hoping will work better for me. I finally ordered a new pair of Tory Burch sandals after wearing these for the last 5 years. They came out with a blush shade that I couldn’t say no to! These are expensive, but I live in them every season and definitely get my money out of them year after year. If you’re not sure on sizing, I usually recommend to size up a half size in all Tory Burch shoes except the Minnie. I bought this dress on sale for after spray tans, haha. 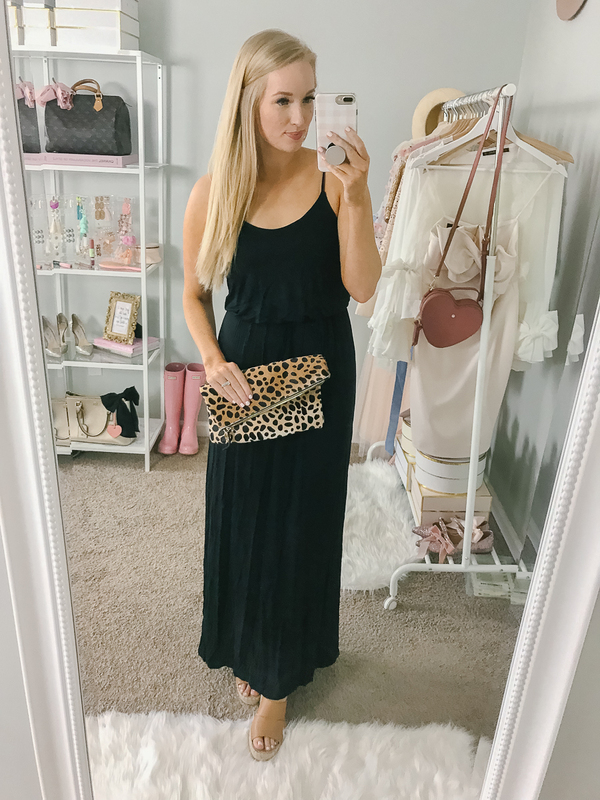 But these comfy dresses are also my go-to for traveling and when I want to be comfortable. I love the two-toned blush suede and gray leather of these wedges. They’re comfy, but heavier than the tan wedges. 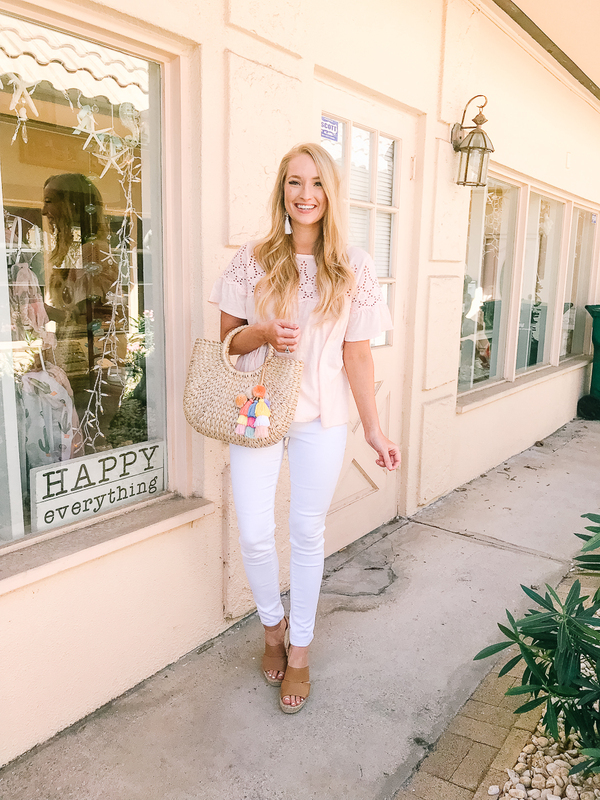 I rounded up some of my favorite Spring shoes here if you’re looking for wedges and sandals for Spring. Random note but I have loved creating more flatlays for my Instagram feed lately! This one is from my Francescas try on haul. I love this sweet little pink and white stripe swimsuit. I don’t have any beach trips planned this year, but for whatever reason, I always buy a few just in case, haha. The 6 fit’s me perfectly and it has great coverage in the booty. What is the website you mentioned that you use to create your shopping list and track sales? I love your Blog and look forward to your try-on Hauls. I like the Tory Burch Sandals, but they are Kinda expensive so I found a Dupe at Walmart called Sam Edelman Circus shoes. Please Check it out and see what you think? 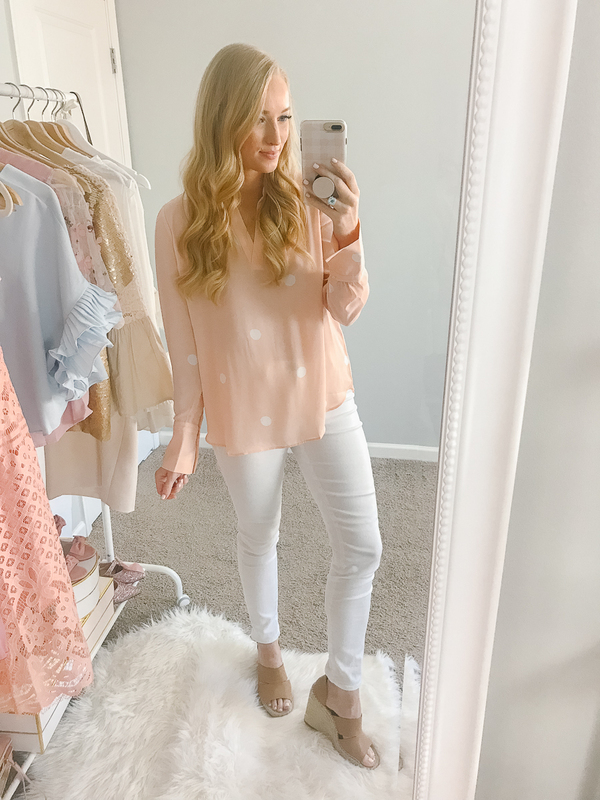 I found your YouTube channel when I was looking for decent spring clothes and I absolutely love your style! 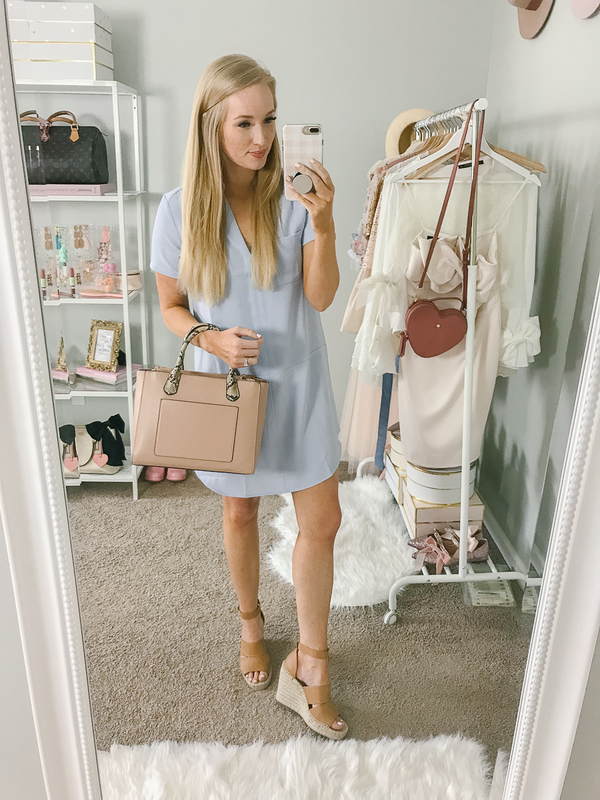 Do you know if Nordstrom plans on restocking the blue dress?